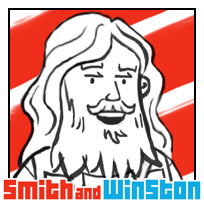 Today we released a 4.3MB patch to Smith and Winston on itch.io and Steam fixing a few small issues that have been reported by players and one we noticed in a Twitch steam. On lower end machines players are having to turn down the amount of debris. <span class="caps" <this<="" span="">THIS IS</span> NOT ACCEPTABLE. So we’ve tweaked the physics a bit to get some more juice from your CPU and get some more debris on screen at 60 fps. If you pressed the equals key (‘=’) you seemed to randomly warp around the level… even to places that you can’t get to normally. We use this debug feature to quickly test new areas of the level and you were never supposed to have such powers because we just can’t trust any of you naughty people can we? Look out for this feature accidentally being re-enabled because “we are idiots” ;).